Location: “Grebentsi” hostel is situated in the new town centre in Zlatograd, next to one of the oldest churches in the Rhodopes - “The Assumption of the Holiest Virgin”. Accommodation: "Grebentsi" Hostel can accommodate up to 58 guetsts: The first floor offers 6 rooms with 4 beds, spacious dining – room and a triple bedroom. The second floor - 6 rooms with 4 beds, 3 interconnected rooms – total 7 beds(1+3+3) and one triple bedroom. All rooms are comfortably furnished and offer individual bathroom. 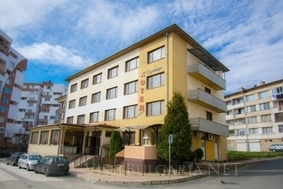 It is situated on the third floor – 4 rooms with 2 beds, one big and two small apartments. All rooms offer cable TV and individual bathroom.